This is an all original ROLEX DATEJUST dating to 1966 and even retains the original gold and steel ROLEX Jubilee bracelet that dates to 1963. This bracelet has usual stretch for its age, but not as much as you would expect-very good shape. The 35.5mm. stainless steel case with solid gold bezel and crown truly looks excellent and is without any major flaws. The original and desirable pie-pan style gold dial with highly sought after Dauphine hands radiates a vintage glow. There are only the tiniest age spots that are barely visible with the naked eye. The automatic winding ROLEX movement was serviced and working perfectly. 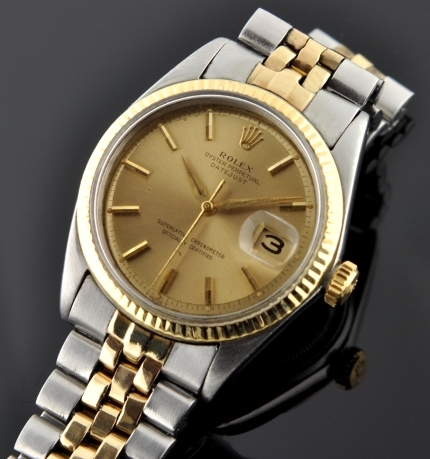 This is a very collectable vintage Rolex Datejust that will surely attract many eyes to your wrist. Only $3150.